Wednesday February 9th 1898 I did up the morning work and we over to Emmas a few moments. I helped Will cut up the hogs and in the afternoon we cut lard. I read in the evening. Thursday February 10th 1898 I was busy about the work most of the forenoon and worked all afternoon frying out the lard. I read in the evening. Friday February 11th 1898 Will went to town after an early dinner and I was over to Emmas awhile. I did quite a lot of sewing today. I knit and read in the evening. Saturday February 12th 1898 I made mince meat in the forenoon and did other work in the kitchen. I did sweeping and cleaning up things in the house. I knit and sewed in the evening. 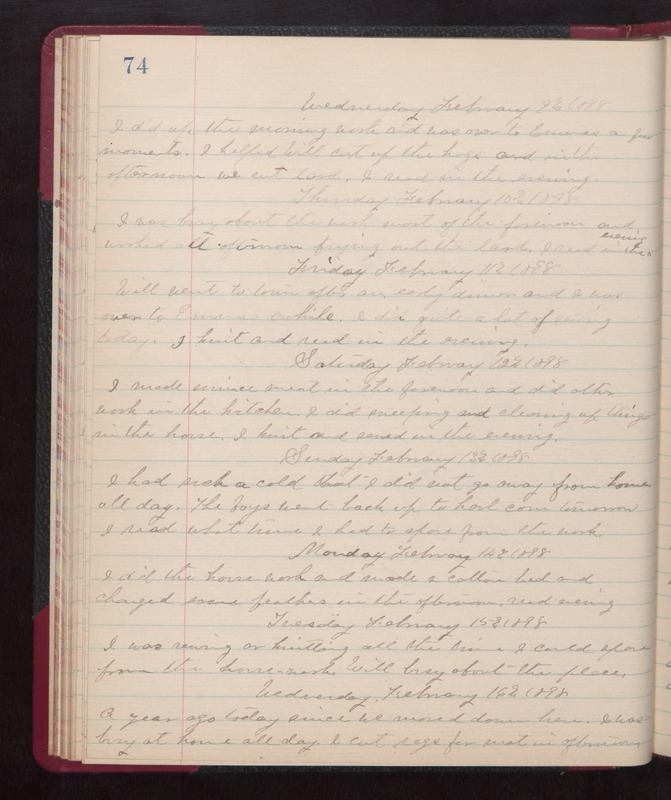 Sunday February 13th 1898 I had such a cold that I did not go away from home all day. The boys went back up to haul cord tomorrow. I read what time I had to spare from the work. Monday February 14th 1898 I did the house work and made a cotton bed and changed some feathers in the afternoon. read evening. Tuesday February 15th 1898 I was sewing or knitting all the time I could spare from the house-work. Will busy about the place. Wednesday February 16th 1898 A year ago today since we moved down here. I was busy at home all day. I cut rags for mat in afternoon.